See Best Price at Amazon.co.uk here. Buy from Wiggle Cycles here. 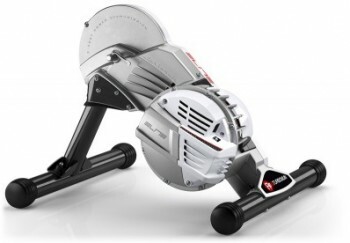 The Elite Real Turbo Muin indoor turbo trainer is one of a new breed that combines two resistance technologies. The first is fluid resistance that is renowned for its road-realistic progressive resistance was you ride and the second is magnetic resistance, which allows you to vary the stiffness so that you can have high power output at low speeds (i.e. just like cycling up a steep hill). The Turbo Muin B+ uses the latest wireless technology to send data using a double protocol, ANT+ and Bluetooth Smart. The Realtrainer B+ is Elites top of the range turbu trainer that connect wirelessly to a PC so that you computer can keep track of all data and also so that your computer can communicate with the trainer to vary resistance. This means the trainers sync up effortlessly with Elites RealVideo software. In addition to this the trainer has ANT+ FE-C which means it can hook up with other fitness tools. This allow the use of other trainer software from other companies so it opens us many more possibilities to train using the best software around. This video describes some of the software features that the Elite Real Turbo Muin can take advantage of. The Real Turbo Muin is the latest Elite trainer and an advance on the original Elite Muin, which was a pure fluid resistance trainer. 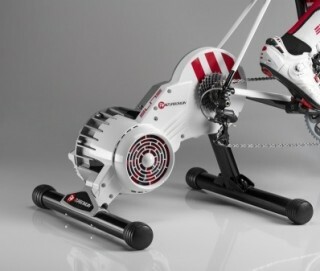 The Elite Real Turbo Muin trainer is direct-drive, which means your bike is physically fixed to the resistance unit. This ensures highly efficient transmission of your pedaling energy because your chain is physically powering the trainer. This is not like traditional turbo trainers where the back tyre spins a roller which is much less efficient. Also, traditional trainers wear your back tyres out if used for prolonged periods while direct-drive trainers eliminate this issue. 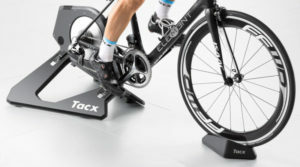 Because this turbo trainer uses electromagnetic technology is can be controlled digitally via the Real Software. This means your resistance can be either manually varied using a smart device or computer, or it can be automatically controlled via training programs. Elite has advanced software that allow you to race on GPS routes or on real films of famous cycling courses. You can even race other riders in live online races. Read more about the software on the official Elite website. Note that some older models do not have the Bluetooth Smart software so check before you make your purchase. Copyright © 2019 · Turbo Bike Trainer a website owned by CTOP Limited.